The Cape Region community should be justifiably proud of its successful efforts to help those who need it. Dozens of charity fundraiser golf tournaments held each year are a vital part of those endeavors. Here are a few examples from the 2018 golf season. Mary Rio of The Peninsula Golf & Country Club in Millsboro founded Clothing Our Kids when she learned that many children in Sussex County didn’t have enough clothes for their school days. Doing something about it lead to the creation of the annual Clothing Our Kids tournament, held this year for the fifth time Sept. 24 at The Peninsula. A field of 144 golfers slogged their way through occasional downpours and high winds, but the participants were all smiles at the post-round celebration at the new clubhouse that afternoon. The event raised over $65,000 for elementary school children throughout Sussex County. The response to this relative newcomer to the Cape Region charity golf scene has been tremendous, and not just from the golfers playing it. COK has spun off its silent and live auctions segment into a new event scheduled for April 4, 2019. The Kickin’ It Up for Kids Evening of Jazz & Generosity should be a fun way to boost the dollars raised for the charity. On Oct. 6, the George Simpson Men’s Group at Epworth UMC held their Dave Waters Memorial Golf Outing at the American Classic Golf Club near Lewes. Diane Stetina won the morning flight, while Rev. Jon Baker won the afternoon portion of the contest. The event raised over $20,000 to benefit three local missions for the needy and homeless in the Cape Region. Last year the Epworth Food Program served over 5,000 meals and also provided canned goods and personal hygiene products to over 1,800. The Immanuel Shelter helped over 3,000 with overnight shelter and meals during the 2016-2017 winter season. The Community Resource Center assisted over 13,000 individuals with a wide variety of issues, including food, family crises, medical issues, and basic needs for infants and children. Trinity Logistics created the Trinity Foundation in 2005 to provide a focused approach to its community efforts. This year 24 teams played a 4-person scramble at the Heritage Shores golf course in Bridgeville, raising over $12,000 for the Foundation. This is Trinity’s largest fundraiser. The money supports scholarship awards to graduating high school seniors, the Thanksgiving For All for meals for local families, donations to the Ronald McDonald house, distributing toys for the Marine Corps’ Toys for Tots program, and other efforts. 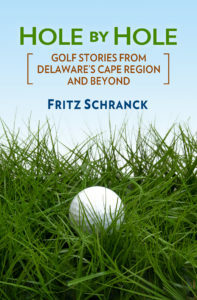 The Delaware State Golf Association Scholarship Fund holds its annual fundraiser golf tournament each year at Rehoboth Beach Country Club. Lead by longtime RBCC golf pro Ron Barrows, the Fund provides thousands of dollars for four-year stipends for graduating seniors with a record of high academic performance, community involvement, and a love for golf. This year’s fundraiser on Oct. 1 raised over $32,400, for what Barrows described as an “approximately 10% increase” over past events. The scholarship application is available online at dsga.org. The award ceremony takes place in June at the annual RBCC Junior Open tournament. Butch Holtzclaw, director of golf at The Rookery, hosts an annual pro-am tournament each fall for the benefit of The First Tee of Delaware. The First Tee is an increasingly popular junior golf program aimed at using the best parts of golf to instill valuable life lessons, while having a lot of fun at the same time. This year’s pro-am took place Nov. 7 at Rookery North and raised approximately $4,000 for the First Tee. Among other highlights, Rookery assistant golf pro Chris Osberg made an eagle for a skin on the par-5 second hole, and County Bank’s Joe Shockley made an eagle/skin on the par-4 seventh. Bayside assistant pro Greyson Rossi also won a skin with his birdie on the long par-3 fourth hole. Some fundraisers are aimed at supporting valuable local institutions more than individuals. These include the many tournaments raising funds for the volunteer fire companies, as well as the hospitals serving Sussex County. If you have the time and the dime, please consider playing in these events as part of meeting your own charitable goals. The folks at Tifosi Optics sent a pair of their new Enliven sunglasses to test, and I’m happy to say they passed. I used the sunglasses several times this fall, especially in the early morning when the low-lying sun presents a challenge. The lenses work as promised. The Tifosi glasses retail for $49.95 MSRP and are available online at tifosioptics.com. 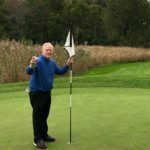 Congratulations to Tom Gargan for his hole in one at The Peninsula on Oct. 19. The ace came on the 160-yard fifth hole.